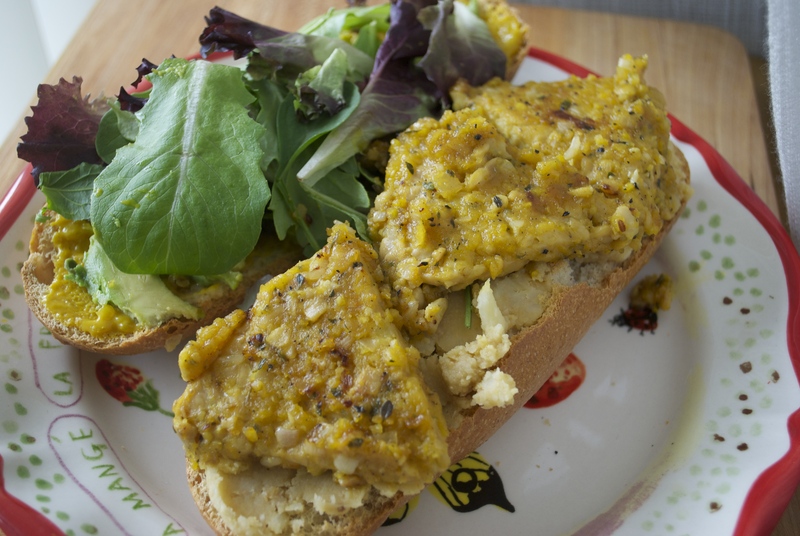 Papaya Glazed Tempeh Sandwich w/ Breadfruit Hummus. Did you know that June is National Papaya Month or something? Not that it matters. 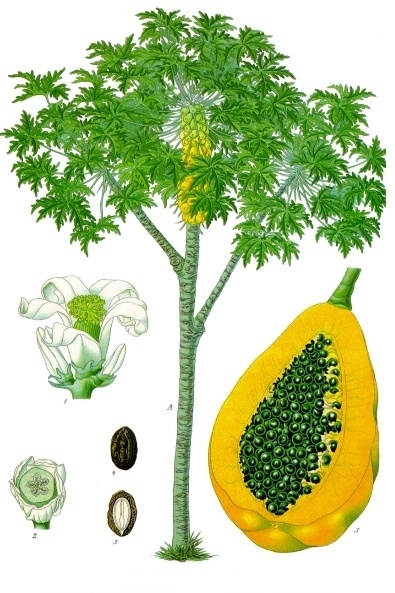 Papaya is always delicious, regardless of month, but in honor of June, let’s talk about papaya. Papaya are rich in nutrition loaded with fiber, Vitamin C, folate and more. They also contain really cool protein digesting enzymes like papain making them really good for the tummy. If you ask me, my favorite papaya are the Sunrise papaya which have a deep orange or red flesh–the latter more rich in lycopene. My favorite way to eat papaya on their own is with lilikoi and lime, but papaya can also shine in your food in countless other ways. This is a hearty and filling sandwich that marries sweet and savory together nicely. First, combine the first 1/4 salt, the juice, oil, brown sugar and shallot in a food processor to create a marinade. Pour the contents of the food processor into a sealable container or plastic bag and add the steamed tempeh triangles and bay leaf. Marinate for an absolute minimum of one hour, up to a day and half. When you’re ready to make the tempeh, preheat to 375°F. Pick the bay leaf out of the marinade. Add the marinade back to a food processor and add the remaining ingredients: water, mustard, papaya, thyme, a tiny bit of salt and black pepper or papaya seed. Blend everything together. Add the tempeh triangles to a baking dish. Add the papaya/marinade mixture. Bake tempeh for about 30 min, checking in on it about half way through to baste the top or flip it and also be mindful of the amount of liquid. Your tempeh is done when the majority or all of the glaze has been absorbed. 1. Layer top half of your bread of choice with condiment of choice. I used Upcountry Onion & Garlic mustard, the same that I used in the glaze, but all of Maui Upcountry’s mustards are the bomb.com. 2. Add some avo slices. Because avocado on everything. 5.. Peanut butter, tempeh time! <–Except no peanut butter, inside joke between me and the internet. But seriously, add your papaya tempeh now. You be the judge of how many triangles to use. 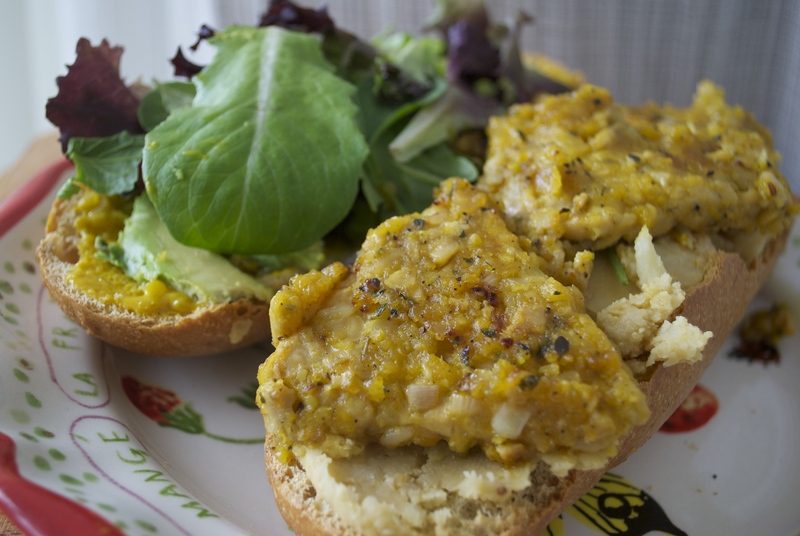 Breadfruit Hummus: To make breadfruit hummus, I combine about 1/2 c steamed (and TOTALLY COOLED DOWN) breadfruit with a heaping cup of garbanzo beans. Add to your food processor with a tbsp or so of unsweetened roasted or raw macadamia nut butter and 2 cloves garlic and about 1/2 tsp sea salt–add more to your taste. Also start with 1-2 tbsp macadamia nut oil and blend. You can add more oil or more nut butter to adjust the consistency. I like things on the chunky side (smooth is good too, but chunky is my pref). ← All Natural Li-Hing Almonds w/ Dried Gold Pineapple.